The Mini has consistently more than proven its capability in competition with very limited and cost-effective modifications based on the standard equipment fitted. Having first ensured the bodyshell (in reality little more than a complex bracket to hold suspension and driver securely in place) is well sorted out by removing all cruddy or rotten metalwork and into something like straight, square and strong we, maximising suspension stability and geometry pays dividends in the enjoyment that is driving a Mini. Understanding what the individual ingredients are helps in pursuing what you want from the experience. Good, reliable, and consistent handling is dependent on a number of factors. At this stage, we’re concerned with clapped out or badly adjusted suspension components. Stiff, seized, partially seized or slack, sloppy, worn out suspension components will cause inconsistent, wayward, confusing and – more importantly - unsettling handling quirks that may take some time to track down. What we want is positively located and tightly controlled suspension movement. Achievement is simple – careful stripping, inspection, correction, and re-assembly of the whole suspension system. More than adequately covered in the various manuals on the market, there’s little point in me covering the whole job here. BUT - it is imperative this is done for smooth, effectively controlled suspension movement. Do it once properly now, and periodic maintenance will keep it healthy. I’d like a pound for every time I’ve discovered seized front top-arm shafts/bearings or worn out steering racks or loose steering arms on various Minis over the years! The ball-joints (swivel pins). How tight the pin should be once the cup-nut is torqued up has been the subject of much discussion. Some say they should be just moveable with thumb pressure - either one or two – dependant on the individual. And how strong your thumbs are! Some say this test should be made with a ring spanner placed over the pin – but how long a handled spanner, and how much pressure? All very inaccurate and un-scientific. Even using the method described in the workshop manual gives varying results (try it – hours of entertainment guaranteed). Checking the ball-joints on a brand new suspension set-up revealed them to be VERY tight indeed. It also depends on the quality of the ball joints. Some after-market items are horrendously made – the swivel pin ‘ball’ sections having a very ‘ribbed’ finish or badly ground grease path - giving rise to un-acceptable ‘stiction’. Hours can be spent lapping these with grinding paste to achieve an acceptable smoothness in operation. So either sift through a pile of these and pick the better finished looking ones, or buy genuine ones. I would recommend genuine ball-joint kits for any Mini destined for competition use. The extra expense is well worth it. For cars used in competition only, the ball-joints should be set with the minimum amount of resistance achievable without any play. Dual duty Minis should have them set so they are moveable with a short handled ring spanner and little pressure. Road cars need to be tighter to avoid very frequent servicing adjustments. The other ‘stiction’ producers I’m going to leave for another article, as they go hand in hand with alternative suspension components. For now there’s some suspension ‘theory’ that needs digesting and contemplation before these need addressing. No matter whether you’re a Formula One team at the very pinnacle of motorsport, or weekend warrior using your vehicle as your daily driver – the goal is the same; to give the tyre contact patch the very best chance of performing to it’s maximum. It is THE most important thing on any racing car – far more so than huge engine power. If it won’t negotiate corners at speed your competitiveness and/or fun will suffer. So what we need to achieve is keeping the tyre flat on the road, inducing minimal distortion, and controlling the load in-put to maximise optimum running temperatures. A utopia rarely achieved, but the goal nonetheless. As we’re not starting with a clean sheet - using an already existing design so to speak -and compromises are needed, we need to invest funds in the areas that will give the best return; the suspension components. Before rushing out to purchase a heap of seemingly useful or sagely recommended components, it’s important to get at least a tentative grip on suspension fundamentals; essential for making initial decisions on which components to buy. Without it future progress will be agonisingly difficult. Essentially, five separate factors combine to describe wheel geometry in motion, and influence how it behaves when encountering surface irregularities (here-in called ‘bumps’ to shorten discourse - referring to all, large or small, smooth or sharp) and corners. Following are descriptions of each individually and associated effects. Just words can make this a little hard going and entire books could be written on each subject - pictures paint the proverbial thousand words, study the relevant diagrams as you read through and get to understand these factors. King Pin Inclination and King Pin Offset – too much of either makes steering heavy and fractious. King Pin Inclination (KPI) – the angle is described by a line drawn down through the top and bottom ball-joint (swivel pin) centres and vertical viewed from the front. Extended to ground level, the distance from here to the wheel/tyre centre-line at ground level is the ‘King Pin Offset’. Ideally the lines should intersect at ground level. This will give both lightness of steering ‘feel’ and virtually no kick back through the steering wheel when hitting bumps – known as ‘centre-point steering’. One of the Minis biggest downfalls, it’s rarely achieved due to available wheel rim offsets and how the suspension geometry is adjusted. The result contributes to the ‘wandering’ feeling experienced over bumps. The greater the wheel offset outwards, the worse this becomes as it increases ‘King Pin Offset’ (KPO) away from the vehicle centre. For more information on KPO see 'Suspension - KPO; adverse effects of fitting wide wheels'. KPI also has the undesirable effect of adding positive camber on the outer wheel, induced by body roll when cornering. KPI changes when the car is lowered, or caster/camber angles changed. Lowering the car, increasing negative camber/decreasing positive camber and reducing caster increases the angle. Raising the car, reducing negative camber/increasing positive camber and reducing caster reduces the angle. Unfortunately this is difficult to alter, so is generally ignored. Some have it better sorted than others, more down to luck than judgement. Caster Angle – responsible for straight-line stability and ‘automatic return’ to straight-ahead bearing when exiting corners. Caster Angle – viewed from the side of the car, the top ball-joint should be positioned behind the bottom one. The angle made by a line drawn through the ball-joint centres and vertical describes caster angle. It’s effect is a self-centring action that causes the car to run straight where no steering input is made and pulls the wheels back to straight ahead when exiting corners. Controlled by tie-rod length, shortening it will increase the self-centring effect, lengthening it the opposite. Increasing it also helps reduce the positive camber induced by body roll. On the downside, increasing caster decreases camber and induces body-roll by virtue of lowering the inner wheel and raising the outer wheel when cornering. Having said that, a big caster angle can cause the inner edge of the inside tyre to re-engage the ground where the wheel goes 'light' in a tight corner, helping to restore some grip. 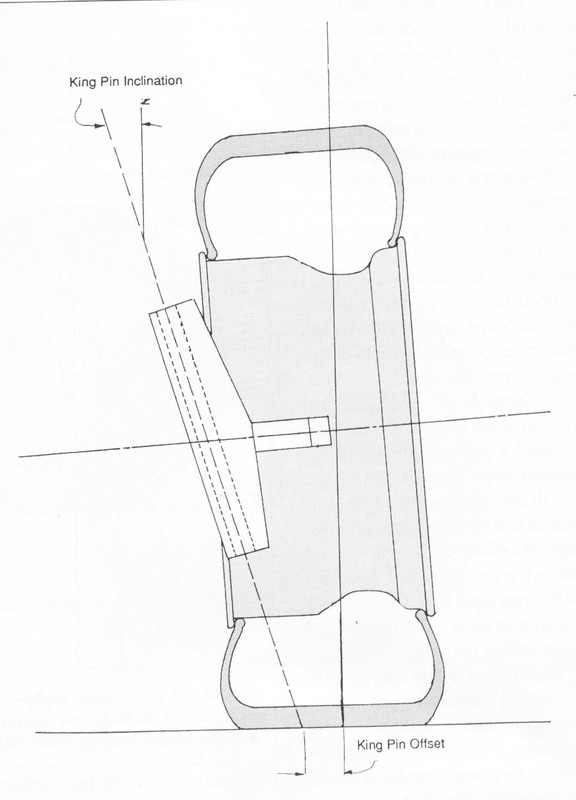 A further effect of increasing caster is a very slight lengthening of the actual wheelbase, increasing in effect as the wheels are turned on the outer side in a corner. Perhaps very slightly increasing stability. 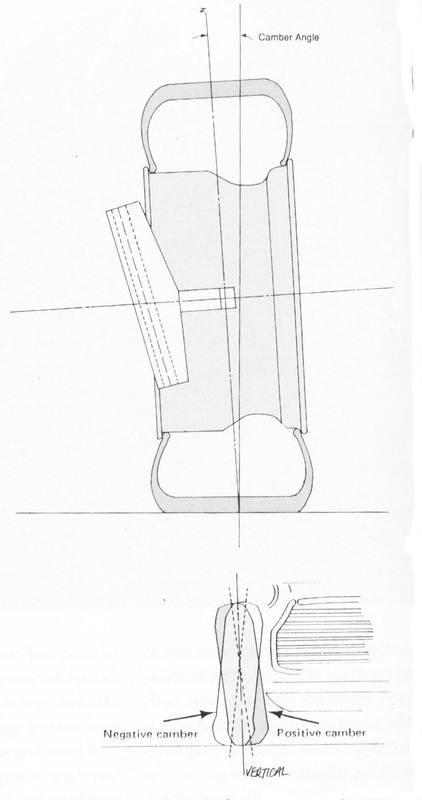 Camber Angle – top diagram illustrates what it is. Bottom diagram applies it to our beloved Mini. Standard examples have positive camber. Camber Angle – viewed from the front of the car it’s described by a line drawn down through the wheel/tyre centre-line and vertical. Positive camber has the wheel/tyre leaning outwards at the top, negative camber the opposite. Camber affects initial turn-in and wheel/tyre attitude when cornering. Positive camber slows turn-in and when cornering is increased by body roll – pushing the contact patch towards the tyre’s outer edge, raises the inner edge, reducing grip. Negative camber sharpens turn-in and counters positive camber induced by body roll, maintaining better tyre contact patch area, and therefore grip. Controlled by bottom arm length. Moving the ball-joint hole outwards applies negative camber, inwards the opposite. The bugbear here is how the length is achieved. Adjusting the whole arm length alters caster angle as well, although this isn’t a linear amount and usually a lower figure. Lengthening the bottom arm increases caster angle, shortening decreases it. Track – top diagram illustrates ‘toe in’, where measurement A is less than B. Bottom diagram illustrates ‘toe out’, where measurement A is greater than B. Track – viewed from above it describes the attitude of a pair of wheels on the same axle line. It’s the comparison of the distance between the leading edge and rear edge of the wheels/tyres. A greater width on the leading edge is referred to as ‘toe-out’ (the wheels/tyres pointing outwards); conversely a greater rear edge width is ‘toe-in’ (the wheels/tyres pointing inwards). Track settings – both front and rear - affects the general stability of the car – encompassing all attitudes including initial turn-in, when travelling in a straight line and during cornering. Affected by all other geometry adjustments made on the front so is the last feature to be set. 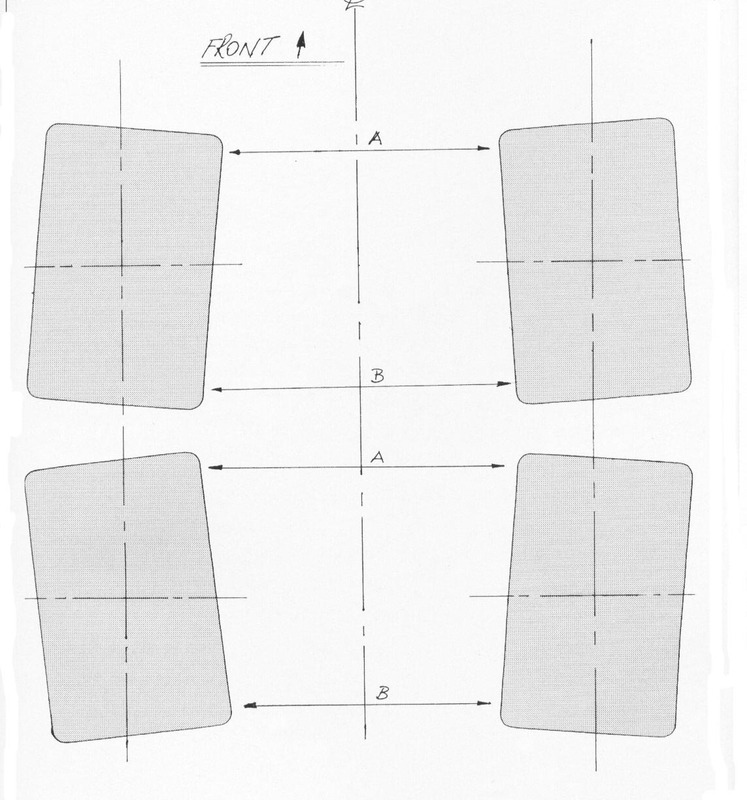 Bump Steer – the arcs described by the different length and differently located pivot points of the front suspension/steering arms (top) cause the wheel to go variously toe in/toe out without any driver input. Scary stuff! 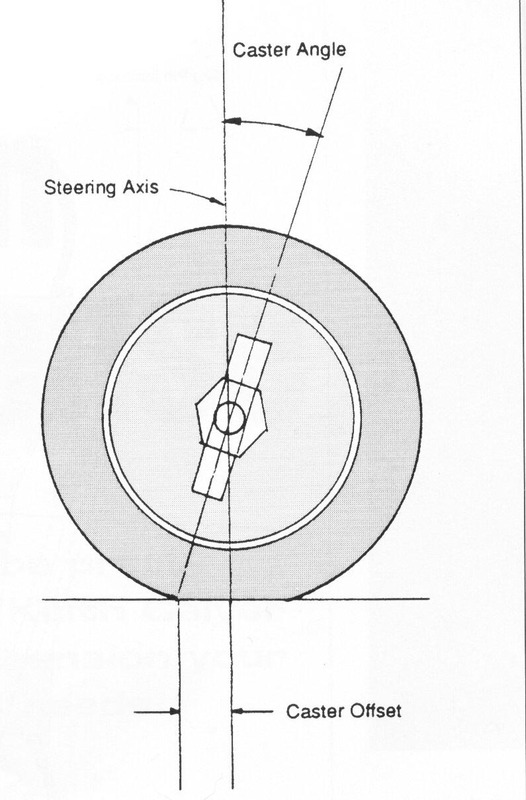 Bump Steer – is where either or both wheels on the same axle line (i.e. front or rear) start pointing themselves in different directions as they rise and fall over bumps without any driver input. Every bit as bad as it sounds. At the rear caused by worn/broken suspension components, at the front controlled by the steering rack, track rods, steering arms, and swivel hubs. It's another Achilles heel of the Mini, affected at the front by alterations to ride height and caster angle. To fully utilise our newfound knowledge, we need to decide which factors have priority over the others; decisions can then be made as to which components we should invest our usually very limited budgets in. Effectively, we’re mainly talking about subframe mountings, tie-rods, front bottom arms and rear radius arm bracketry – in that order. Not much of a list, but crucial to get right. The subframes need to be positively located in the bodyshell, something rubber mountings just don’t do. On pre-’76 cars – this amounts to fitting alternative bushes made in something a little more resilient than the standard rubber items to the rear. Post-’75 cars will also need the front subframe mounts sorting in a similar fashion. These can be bought in various materials from the many Mini specialists – but avoid anything that can be distorted in your fingers, no matter how minutely, where racing is concerned. Preferably go for something solid. They may prove trying to fit – but persevere. A halfway house for the weekend warrior is something as stiff as possible yet with good noise absorption properties to keep you sane. Excessive amounts of resonance will have your ears bleeding and brains oozing out of your nose in a very short time! The last thing you want when competing in a Mini is the rear subframe moving about. Rear end steering causes attention grabbing handling quirks. Made worse if it’s doing it independently of your carefully set geometry! And a rubber mounted front subframe will cause vague, in-precise steering. As intimated earlier, I’m leaving component description and recommendation to another article, as there are numerous alternatives on the market and design priorities to be considered, along with how to juggle them to give the best/desired result.